Letterpress printed by hand on a 150 year old press on 100% cotton paper (no trees!). Printed with metal type set by hand using hand-mixed inks. Card measures 4.25 x 5.5 when folded, blank on the inside. Comes with a cute little kraft envelope. Iron Curtain Press is a custom letterpress print shop staffed by the best team in Los Angeles. We specialize in custom stationery, business cards and collateral, announcements, invitations, and small art prints. We also produce our own line of greeting cards and office supplies under the Iron Curtain Press and Shorthand brands. Our headquarters and store are at 5028 York Blvd in Los Angeles, California. Visitors to the store-front Shorthand can shop the full line of products that we make on site along with a carefully chosen collection of office and desk products we love. 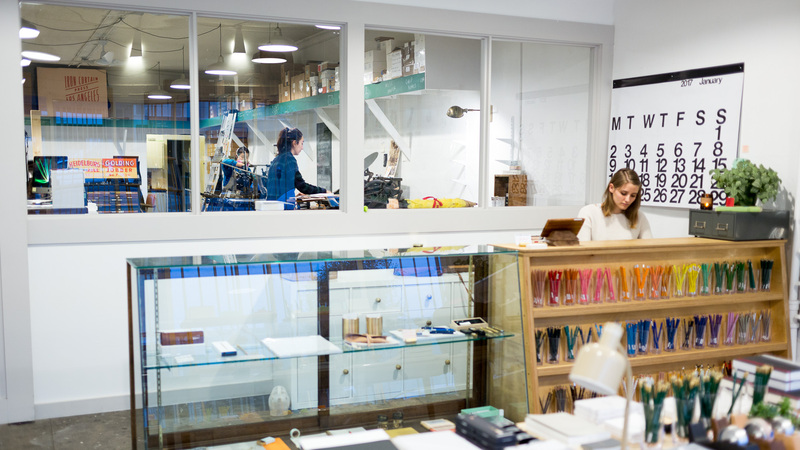 While in Shorthand, weekday visitors can see us printing and assembling products and projects through large glass windows. Clients that wish to receive a consultation regarding a custom project should make an appointment so that we can prepare samples and our full attention. Founded by Rosanna and Joel Kvernmo in 2008, the print shop has grown from the humble beginnings of their backyard shed into a fully fledged custom print house and store; we couldn’t be more proud of what we do.